Palmezzano was an Italian painter and architect, who painted in a style recalling the earlier Northern Renaissance, and was mostly active near the city of Forlì in Emilia-Romagna. After his initial training with the painter Melozzo da Forlì (1438 – 1494), who had collaborated with Piero della Francesca (1412 – 1492) and was widely esteemed as a master of perspective and foreshortening techniques, Palmezzano went to Rome in the early 1490s. It is rumored that Palmezzano may have then traveled to Jerusalem to join the team painting frescoes at the Holy Cross church there, but no actual evidence of this exists. He is, however, noted in property records as residing in Venice in 1495. Shortly thereafter, Palmezzano returned to Forlì, where he spent the rest of his long life, with only brief excursions for commissions in other areas in the region. Palmezzano's studio was prolific in producing altarpieces, most commonly featuring the iconic arrangement of an enthroned Virgin with child on her lap, with symmetrically depicted saints in the foreground below. Venetian painting in general and the work of Giovanni Bellini (1430 – 1516) and Conegliano (1459 – 1517), in particular, were to remain the most powerful influences on Palmezzano's output. Moreover, he remained faithful to the Venetian style of the later 15th and early 16th century. 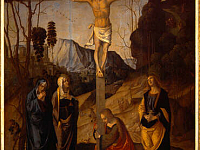 His, Crucifixion, painted sometime between 1500 and 1510, is good example of his strong Venetian coloring, in both the expressive figures and detailed background. Mannerism entirely passed him by, and he seemed immune to subsequent developments in Venetian painting. One of the most attractive facets of Palmezzano's oeuvre is the distinctive and suggestive landscapes that form the backdrops of many of his altarpieces. These are a blend of the ideal and lyrical, and of the observed reality of the Apennine foothills and mountains to the south of Forlì, for which Palmezzano clearly had real affection. These landscapes are also employed to subtle and imaginative effect to convey the symbolic religious messages of the works.